Really?! The thing about the clash between both of you is that's absolutely non-important. Literally ridiculous. And that's true for both of you. Neither one can do anything about what has happened, so the only result is that anyone searching for "OS X"+"eGPU"+"Thunderbolt" is pestered of this stupid, childish, non-sense discussion. Could you stop it please?! Both of you made remarkable progress. You could say that it's reverse engineered but that's true for both of you as once the only thing to do was to edit the PCITunnelCapabitity-flag and now the difference between the OS versions needed to be examined. And so? Nothing! That's all. There are guys which like to tinker and there are others who respect or disrespect their work. This is, what's commonly called "life". Really?! The thing about the clash between both of you is that's absolutely non-important. If not important, why bother posting? Why not just get on with "what's commonly called "life". 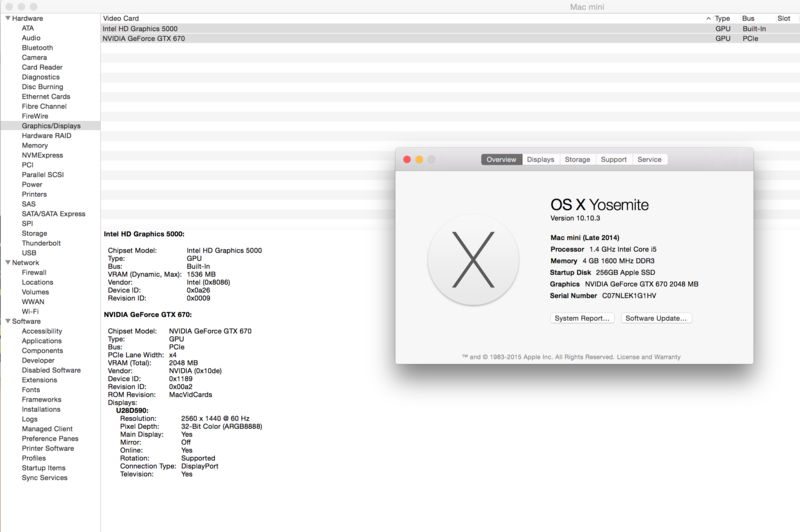 an example of such setup on screenshot - mac mini 2014, TB2, Akitio box and gtx670 videocard. 3) send me the file ioreg.dump (you will find it on your desktop, after doing step 2.a), your mac model and display model to email - bobahu4@gmail.com subject: "egpu Display"
it allows to enable display plug detection on eGPU (in OSX), multiple displays supported, card will work just like in classic mac pro. it survives update, I have tested 10.10.4 beta, additional reboot needed after update installed, then everything works again. I can't guarantee Apple won't break this with future updates, but I'll try my best to fix it if they do so (I have such eGPU system as well). The tool needs kext-dev-mode=1 in your boot-args, but you probably already have that if cuda (see step 1) works for you. Supported macs: TB2 macs except Retina Imac, TB1 macs shouldn't have such issues. I'm in trouble installing eGPU on my Mac mini 2011. Can you give some assistance? I made the usual procedure for TB1 machines with a GTX 470, and I actually got it to work, BUT only with Mac default drivers and I can't use the eGPU on startup, only connecting the monitor after the system started (and it's not always working). Seems that the graphics driver isn't starting on boot even with nvda_drv flag on boot-args. I saw that some users got in trouble to use GTX 470 graphics on boot in newer macOS versions, but I don't think I have the same problem since I can still "use" it as I meant before. The problem is just when I restart the monitor signal from the card stops and I'm forced to use internal graphics again. Hi, do you mean Nvidia GTX470 or AMD RX 470? What did you do to mod the OSX files?